Firstcharting launches Realtime Data Plugin for Amibroker in trial mode. Now with this data plugin you can access NSE(Cash,Futures), MCX Futures, MCX-SX Futures, NCDEX Futures, International Forex Cross Currencies realtime charts in Amibroker with Zero Data Delay. 3. Download Microsoft Visual C++ 2008 Redistributable Package (x86) and install it in your machine. 4. Now Open Amibroker -> File Menu ->New->Database . And fill the instruction as shown below. 8.Now goto the charts and select the required symbols and start your favorite charts in realtime tick by tick with zero delay. how about username & passwors ??? @Trader : In Trial Version you dont need to worry about username and password. Use the default one. free trial is for how many days? Trial End Date is not yet fixed. It will be finalized very soon once the testing is done. I am New to Amibroker. After completing the Step 3 , i can’t find the “FC-Data” from the datasource, Shall i missing something to do ?? I am using Amibroker with 1 min data from Jan 2010 till date. Does it work with my current database ?? u got this at right time ……as of now there is no good vendor for Nse cash Data. Today i have tried setting up the firstcharting trial. I am OK till the Green OK for plugin status. But not able to see any symbols. Please guide. And Close the Dialog box and now you will be able to see the symbols in your amibroker. In that case you have to download Microsoft Visual C++ 2008 Redistributable Package (x86) if you are not able to see FC-Data plugin not additional software is required. Options will be enabled once the Product goes Commercially Live. It will not be available in trial phase. IT IS NOT SHOWING PER CANDLE RATES ANT TIME FRAME. I CAN’T OPEN A OTHER CHART WINDOW. GOING TO MAKE A VERY CHEAP AND BEST COMMERCIAL SERVICE…. raj… bro… nice…. its working superb…. @Shailendra : It Backfill happens even in the non market hours. Every time you are using the plugin you have to connect to firstcharting server and you have to download the database for the firsttime alone. And the backfill happens automatically whenever you are visiting the symbols for the firsttime. Qno 2. Are we able to get full historical backfill for the symbols visited as you have said above or there is some time frame due to this being a trial mode. Also if the answer is yes then is the data splits and bonus adjusted data. 1. It is said that the backfill happens automatically, The ATP calculated is wrong as the volume is coming not correctly. kindly rectify the same or pls let me know, if there is anything that i hav e missed in the setup. Unable to download data for Indexes like Nifty, Banknifty etc. Stock data is getting downloaded. Done the process above mentioned, but i am unable to see the symbols. Plugin status is also ok. If i click on Any other inbuilt symbols i am getting Error which is Amibroker broker cross recovery system. I am using Windows 7 64 bit version.Please let me know how to solve the issue. No the product is in very early stage of testing. and currently it doesnt supports any autotrading. And moreover it is not a auto trading plugin. Updated DLL plugin is likely to release shortly. Please wait for that! 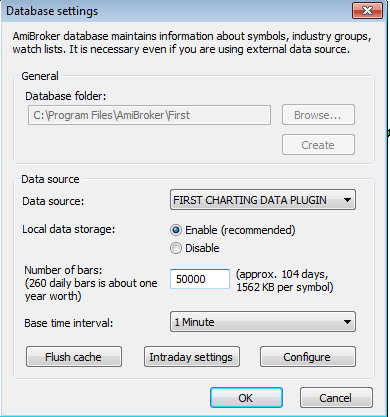 Yes, Everytime Opening the Amibroker you have to go to file->DataBase Settings->Configure->Connect and click on the button “Close if the symbols already loaded” and Press “OK” Button so that the datafeed connects to the data server. Please help me to fix this error. Thanks. The Day’s Last datafeed is at 4:30 PM , why so ? Is i need to do setting in my amibroker ? Which instrument you are looking into? Are you able to see the datafeed with live ticks? In NSE Futures Segment, The every day’s last candle showing time of 4:30 PM , the earlier candle was @ 3:30 PM. I can send you the screenshots , tell me how and where to send. Just check in my system iam able to see the live charts. Which version of Amibroker you are using? I tested in 5.5 and 5.6 version it is working fine. I am Using 5.40, i am able to see the live charts. I am using the Amibroker 5.40. NO problem with seeing the live charts.. i am able to view the same in NSE Futures..
My only consent with the everyday’s last data tick @ 4:30 PM, it also showing volumes n Price etc. the system is getting connected with the server n its also showing “OK” in green in the bottom but there is no data feeds coming in…. if i download this plugin can i get Eur/USD,GBP/USD, USD/JPY, and USD/CHF charts. 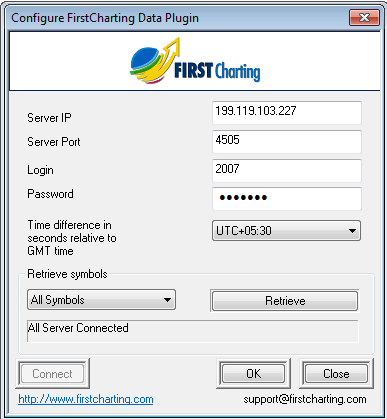 The New Firstcharting Data Dll Plugin for 32 Bit OS doesn’t have USer Name n Password. Not able to connect to the FirstCharting server , hence wanted to check are there any issues on the server end or it’s my local system problem. @all, Pls do reply if anyone else facing the same problem. If trail version has so many issues, this a data feeder and if app does provide the same, people who are waiting to buy when it becomes commercial might loose interest. Just wanted to update everyone, App working all fine. its not working from 12 jan 13. From Friday on words DATA COMPLETELY NOT COMMING,When i downloaded the new version,its not displaying the plugin as well. i got the charts and it works fine except one error sometimes. I have send the image also to ur mail. First of all a ton of thx on ur efforts. I use Amibroker 5.5 version and added ur FC-Data plugin. It works fine, connected 50%. But now often datafeed completely stops even after connecting, Login received, Heart beat received etc. Can u address the concern. Pls remove this plugin for the website its a wast of time for all traders, its not working why are you not giving exact dll files and even if we place that it will not work. dont waste you time for this crap software. Dear sir, just now i have installed FC realtime data all i have done what u r mation but no candle is diplay in ami.. so what to do ? Deepal : Trial period is over now. Request to pls share the subscription details for the FirstCharting RealTime Datafeed, Pls. The data plugin connects, it shows Green and Ok sign. But on charts nothing is loaded. Earlier it was working fine. But past 2 to 3 weeks it isnt. If the trial period is over. Then what is the actual pricing offered for the subscription. Also would like to suggest that if possible keep the connectivity for Free but restrict Loading of Few Scripts only. And introduce scriptwise subscription if possible. Just an over enthusiastic suggestion. i am unable to connect the RT-DATA. I had already downloaded the required softwares and installed. Download the latest plugin. Few more Bugs got fixed and trial is likely to extend for another one or two weeks. Let me have your feed back. Now the Backfill download is ultrafast and the plugin looks more robust , lighter and thin than the earliest. 1. Same link to download latest plugin? 2. Do we need to install FC MT for this? Gopal you need to download the symbols after connecting to the server. Pls notify the pricing detail asap. very nise work , but only trail , expire date dear sir & live data mcx & mcxsx data price 1 months . Delete the older DLL plugin and update with the new one. I noticed price activity continue well after market closure till 4.00 pm. Why so?? i think the plug in behaves differently in different machine ,depends also with os and net as above reponses. in my case i only able to download symbols in previous plug in update. but candles were not perfect. Hi Rajendran! Just for off the chat with the FC support. They are clear they do not support Amibroker plugin. They only support MT4 and the web based interface. I even sent them the link to this page. Very clear. no support for Amibroker. Is this a recent change? Support will start once the product goes commercially live. Hi, This was working fine for the last three days.. except for some lag around noon. However, this morning (28 Feb 13) one has not been able to connect!!! Whats up? Anybody knows? Is anybody else able to connect? Demo is active now after a small update at the server end. Possibly you can able to connect now. Firstchart data plugin i have saved in respective folder of Amibroker but whenever i create new database this dll is not available in the list of Data Source. So I can not try this plugin. Please guide me of a solution. Please follow the above mentioned procedure. Save the dll plugin in Amibroker/Plugin Folder and also ensure that you had downloaded Microsoft Visual C++ 2008 Redistributable Package (x86) and installed it in your machine. It started working alright… but there is an issue with the futures contracts. Since the Mar contracts were not getting listed, I did the configure-retrieve NSE futures again. Now, it lists Dec, Jan, Feb and now Apr contracts!!!!! I tried to do it afresh and in that case it does show Mar13-NSF contract, but after the NSF there are two special characters that are appearing. But no bars are getting downloaded!! There are other issues also which can be taken up in due course; but these are important. Not sure when the demo expired.. since it was working as of yesterday.. though there were quite a few issues. So how does one subscribe for this? I couldnt find anything on the firstcharting site. And have the issues particularly with respect to the futures symbols been resolved? And finally, will it support all symbols? Thanx for the prompt response… However, couldnt do the needful since even a search of the entire amibroker folder did not reveal any such file!! In fact there is no *.symbol file nor is there any FSSPL* file. Could u please confirm the file name and its location? Still awaiting response on the subject. The Futures symbols are still not getting listed and the data is not available. Please Redownload the symbols you would be able to see the updated symbol list for current month and next month futures. everything is w.r.t installation and setup , but i could able to see only 1 min chart , am i doing something wrong / different version to see the back fill data / do i need to pay for it..
1. Whether we can delete closed all contracts and retain only current, near and far contacts? 2. Currently all segments / exchanges are shown in numeric/alphabetical order. Can we segregate it segment /exchange wise? 3. When we can expect it to be live commercially and what would be the approx price band? Still no improvements. In fact, there is nothing except USDINR MAR13-MCX. The moment we connect server, Amibroker produces violation message (which I have pasted earlier). The only choice is click recover or exit. When we click recover, I can see very few scripts from MCX. Which version of Amibroker you are using? Anyway I have got rid of this plug-in. which icon you are referring? I found following errors, when tried to configure the database. Pl solve it. Please redownload the contract symbols. You will be able to get the updated list. When I configure the database all the servers are connected and symbols also received. But displays errors when clicked on ok. The symbols of Aluminium only displayed in the symbol list. others are not displayed. pl solve it. I’ve configured the database and its showing that the servers are connected and symbols also received, but charts are not displaying. Its showing a green Connected Button sometime, but later it go waiting and need to right click and need to click on connect, then it again turns green, but didnt display. Its happening again n again when changing the script. Also for NSEFutures, Its showing as NIFTY DEC12-NF, NIFTY JAN13-NF, NIFTY FEB13-NF, NIFTY APR13-NF but not NIFTY MAR13-NF, instead its showing NIFTY MAR13-NSF. Is it current months symbol? Plz look into the issue. Sir, Good Morning. The plug-in you have provided is working well. But Futures are not displaying. Today morning onwards it is not displaying anything i.e., current data. Is the trail over Sir. Things seem to be going from bad to worse!!! Today no charts are getting displayed even for the cash segment and the date is displayed as Jan 70!!!! As regards the futures, the Mar futures symbols are still not coming up correctly and what are getting listed does not throw up any data whatsoever. Only thing though, the data is getting displayed in the quickwatch from which it is evident that the quotes are coming through and probably there is some display issue. It would be gr8 if the issues could be resolved. PS: Incidentally, I am ok with working offline with the developers on the issues having handled s/w dev work earlier. first charting trial the end . Not connecting today. it that trial ends ? plz inform. Thank You! Not sure when the demo expired.. but from what we have been seeing and reporting.. there were quite a few issues. So how are we sure when we subscribe that these issues have indeed been resolved? So how does one subscribe for this? I couldnt find anything on the firstcharting site. And have the issues particularly with respect to the futures symbols been resolved? And finally, will it support all symbols? We Product havent gone live yet. It is still in testing mode. Soon we are coming with bugs fixed. Thanx for the inputs and we do hope to see youll coming on stream soon. BTW, one is not able to connect to the server. Is the trial over or is it some issue that is preventing us from connecting? thanks Mr Rajendran. wish u all the best. sir i m not able to see any symbols after downloading firstcharting RT Data…even in charts >symbols its blank ,i m not able to see any f&o >mcx>currency symbols.. The symbols for May futures are not getting retrieved. Tried many times..
Is there any resolution in the offing????? Any ideas on how this can be resolved.. I installed as per your instruction. I was connected and Load performance is only 50% and unable to find out any symbol in the list. What to do…? It is outdated now. Better to go with paid RT. Please Suggest best and free or less price NSE cash data feeder for amibroker and if possible can tell me how to designee 3rd party software of data feeder what are the requirements, how to get data from google and that data and how Amibroker can read and save. i have good team of .Net developers can please give the gaudiness to develop the software. Even though i followed all steps but i am not able to connect; its showing Disconnected Every time. Now it is no more working!